Have you ever been hungry? Thirsty? Not for bread or water... but for growth, enlightenment... and not to have anything to quench this thirst! Starved of spiritual food and to have only some crumbs dried by 50 years of hiding... In the Church of China, I was a witness to this desire and hunger to learn, the need to acquire more autonomy: to be able to choose, dialogue, accept, refuse freely, to affirm themselves: in short, to be women! Huguette Chapdelaine, m.i.c., has worked to integrate psychology and spirituality for young Chinese religious in China. Her previous work in Taiwan had prepared her for this mission. After 35 years of mission in Taiwan, I had said good-bye to the Chinese people overseas. But there I was, invited to Beijing, to a National Seminar where 38 young religious from 18 developing or reemergent congregations would experience a month of personal and spiritual formation. With these young people who already held positions of authority, we explored personal, community, churchbased and spiritual courses, through activities, prayers, individual and collective meetings. The religious are divided into two groups. The first includes the young women who joined the ranks of previously existing congregations, which although dispersed, remained in China following the advent of the new political system. Together until their retirement age, these elderly sisters witness through their life of prayer and service. There are Franciscan Missionary Sisters of Mary, Daughters of Charity, Little Sisters of Sainte-Therese (founded of the Father Vincent Lebbe), Holy Family Sisters and some others. The second group includes the congregations established directly by the bishops in recent years. Whether they belong to the first or the second group, all the congregations are under the authority and the exclusive competence of the bishops. There is only God, our tender and loving Father, to sustain these hearts eager to live a religious life totally committed to following Christ in pastoral and social service. In spite of their desires and efforts, the bishops, most of them elderly, are challenged by many difficulties incorporating these women devoted to living in community. Because of their initial lack of training, rules of life and particular orientation, certain young women are sent by their bishop to other communities, already well established, to be initiated into the religious life. After one or two years, they return, two from here, two from there, and are then entrusted with the mission of founding a new congregation. Traditional communities stress formation and experience. It is unimaginable to establish that in so little time! Faced with certain gaps of formation, several religious congregations call upon resource persons from elsewhere. As with any service, the person who gives, receives more. In Beijing, I saw opened hearts, nourished spirits, souls filled to the top with giving and receiving forgiveness. I met dedicated women, joyfully taking the road of their respective mission again to the four corners of immense China. I was touched by their devotion at the side of the sick, of the AIDS patients... all the while ensuring the doctrinal formation of the young sisters. And I noted their courage to face the innumerable difficulties that await them. If my contribution could so much as slightly alleviate the spiritual hunger and the thirst for these religious, I return from there grateful to God. And... I often think of the sisters of China: they have an urgent need for our sincere prayer to God that they thrive in His service. At the request of the Church of Hong Kong, we have to support the bishops, the priests, the nuns, the seminarians and the faithful in this delicate period where the "leadership" passes from the old people to the younger generations. And over all, we have to help the Church of China to face the challenges of the modern and secularized world. 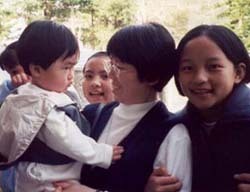 Within the framework of a continuous training plan which they have the courage to continue despite the difficulties, 37 more young Chinese nuns will experience, in September 2005, a similar psycho-spiritual integration at the Catholic Center of formation for religious in Taiyuan, in the province of Shanxi, about 500 km to the south-west of Beijing. I will again form part of the formation team. If pain and hope can coexist, I would say that what I feel after this short but very intense experiment with Beijing is very good! In 1909, the first group Of Missionary Sisters of the Immaculate Conception who left Montreal for a faraway mission land departed for Canton, China. At present, two Sisters are in mainland China and 15 others are working in the Church of Hong Kong. In this highly progressive , demographic and economic region of Asîa in search of meaning, identity and security, our Sisters are committed to being evangelizers, fostering the missionary spirit. After more than 150 years of British rule, Hong Kong has presently a new sovereign. But, the new is really old... China has reclaimed her own. The former colony has been transformed into a new Special Administrative Region (S.A.R.). Under this new rule, it enjoys a high degree of autonomy except in matters concerning defence and foreign affairs. Situated on the southeast coast of China, the region comprises the island of Hong Kong, Kowloon on the mainland, and the New Territories to the north. lt also includes more than 230 islands. Lacking all natural resources other than an excellent harbor built within its limited geographical constraints, Hong Kong has become a centre of global commerce. Today, it is home to seven million of some of the hardest working people, traders and economists. 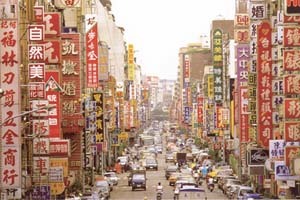 About 98% of the population is ethnic Chinese, most of whom are Cantonese. 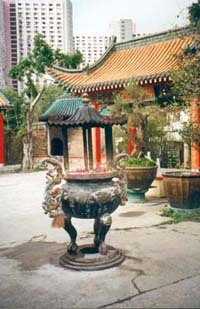 Hong Kong has long been the meeting place of East and West. The roots of its internationalism are deeply and irrevocably embedded. These include its large expatriate population, an unrivalled network of international schools, the retention of English as one of its two official languages, the coexistence of several religions such as Buddhism, Taoism, Confucianism, Protestantism and Catholicism. There is, too, its spectacular cross-cultural lifestyle. Hong Kong's cosmopolitan nature clearly underlines its high degree of autonomy under this 'one country, two systems" set-up. It is proud of its new place in China. Therein lies its value to China: being a bridge between the Mainland and the rest of the world. Japan is a fascinating country, a land of colour and contrasts, a blend of East and West. We find graceful and well-preserved temples coexisting side by side with modern buildings. Though the country has embraced the most modern technology and ideas, it has not lost its mystic soul. Its people remain governed by traditional social values and its system of etiquette and manners stemming from feudal days is still alive. The prominence given at all times and everywhere to the aesthetic is part of its uniqueness. For visitors, Japan exhibits the beauties of its land and the spirit of its people. Japan's history has a cyclic character of opening and closure of its frontiers. In the 9th century, it broke off all relations with its neighbours and embarked on an era of isolation lasting for three centuries. During the 17th and 18th centuries, it again showed hostility to all foreign religions and secular influences, thus carrying out a determined policy of national seclusion. This period lasted 250 years until Emperor Meiji (1868-1912) led Japan from being an isolated, agriculturally based, feudal society to a modern state. However, World War Il left Japan in ruins. A new start was required and a re-examination of national values was undertaken at every level. The country has few natural resources; people are its greatest asset. New orientations, together with inherent qualities of Japanese society such as a sense of mutual responsibility, competitiveness, dedication, royalty and perseverance provided the structure for its future success. in less than half a century, Japan became a world financial power. In its policies concerning foreign affairs, it has adopted an attitude of international cooperation and the promotion of peace. In this modern democracy, the emperor retains his throne as a symbol of national unity but in reality, power rests in networks of powerful politicians, bureaucrats and business executives. The archipelago of 127 million people remains pre-eminently an island nation with a great majority of its population consisting of ethnic Japanese. Japan's language and aspects of its culture set it apart from its neighbours on the East Asian mainland. It is the land of bonsai, Zen gardens and the delicate art of flower arrangement called ikebana. After having responded to the call of the Church of China in 1909 and of the Church of the Philippines in 1920, our Foundress welcomed the invitation of the Church of Japan as another occasion of bringing the Good News to a non Christian land. The first departure took place in November 1926. Our pioneers worked for a few years in the southern part of the country, then moved north to Koriyama in 1930 and to Aizu Wakamatsu in 1934. All seemed to augur a bright future for their ministries, when in 1941, the U.S.-Japanese War broke out. For two years, the Sisters lived in their convent of Aizu Wakamatsu under military supervision. In 1943, with the exchange of war prisoners, our Sisters returned to Canada. After the war, they came back to find Japan devastated and in ruins. 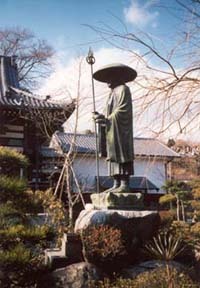 The official state religion, Shinto, was abolished. It was the start of a new era. That period saw the reconstruction of churches and a good increase in the number of schools, hospitals and charitable institutions run by different Christian groups. In 1949, the St. Francis Xavier School in Aizu Wakamatsu welcomed its first pupils. The following year, we opened a Kindergarten in Tokyo, then another school in Koriyama in 1958. 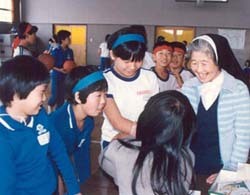 After 75 years of presence in the Church of Japan, it is with joy and gratitude that the Sisters commit themselves to pursue their mission to work as Church, for the evangelization of the Japanese society in a multicultural globalized age, by proclaiming the Good News of Salvation to those who do not know Jesus Christ and by promoting missionary awareness among the Christians. They look for ways of assisting people to encounter Christ through their life witness and various apostolic works: Christian education, pastoral ministries, work among the emigrants, as well as involvement in social justice and environmental concerns. Although they are limited in number, they participate in the sending of missionaries to other countries. They accompany groups of ASMIC who wish to live the spirituality of thanksgiving bequeathed to our Institute by Délia Tétreault and are also involved in the Inter-Asia programme and activities existing between our missions of Hong Kong, Taiwan, Philippines and Japan. In 1521, the Spaniards, led by Ferdinand Magellan, discovered the islands to which was given the name Filipinas in honour of King Philip of Spain. Blessed with abundant natural resources, the islands have attracted traders, adventurers and empire builders for centuries. Today, with a population of 76.5 million - mostly of Indo-Malay, Chinese and Spanish descent, the Republic of the Philippines is the third largest English-speaking country in the world. The succession of various foreign influences has molded a unique Filipino nation and culture. This rich heritage is reflected in the diversity of customs, language, art, architecture and in more than a hundred ethnic groups. A splendid tradition of warm hospitality is a way of life among Filipinos. Relish the innate beauty of the land and find expressions of welcome and friendship in song, graceful dances, in ritual and festivity. Smiles, laughter, ingenuity and deep spirituality remain despite the industrialization and modernization of recent years. The first missionaries of our Institute who left Canada went to China inl9O9. They undertook services in the field of health care and education where their zeal and dedication soon became widely known. In 1921, Dr Jose Tee Han Kee, a close collaborator in their mission work, was named Director of the Chinese General Hospital of Manila. He then requested the Archbishop of Manila to send M.I.C. Sisters to assume the administration of the hospital. This facility was serving the Chinese community which at that time numbered nearly 40,000. Délia Tétreault responded favourably to the request. This new mission was in line with her vision and missionary zeal particularly that of reaching out first to those who had never known Christ and of serving the poor. 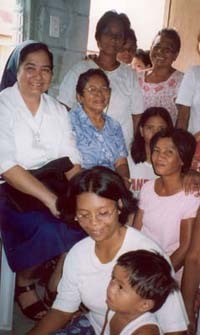 Five Sisters were assigned for this first mission in the Philippines. 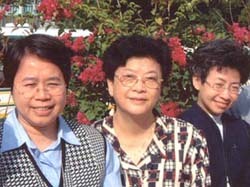 The friendship that developed between the Sisters and the families of the patients initiated their social work ministry. Home visitations and catechetical instruction brought about a number of conversions. The young Chinese converts, fruits of the catechetical classes, eventually inspired the foundation of the Immaculate Conception Anglo Chinese Academy in 1936. The Island of Taiwan is a little more than a hundred kilometres off the coast of Mainland China. In 1590, a crew of Portuguese seamen bedazzled by its natural beauty named it Ilha Formosa, the Beautiful Island. First a protectorate of the Empire of China, and then a Chinese province, the island was ceded to Japan after the Sino-Japanese War (1894-1 895), and its occupation that lasted for 50 years. After the Second World War, China recovered the island and gave it back its Chinese name Taiwan. In 1949, after the Communist Party of Mao Tse-tung won the civil war in Mainland China, Marshall Tchang Kai-shek took refuge in Taiwan with members of his army and of his Nationalist government. He proclaimed Taipei the provisional capital of China. This status remained until the United Nations, in 1971, recognized Peking as the seat of the Chinese government. Eager to curb the expansion of Communism in Asia in the early 50's, the Western powers used Taiwan as a model to demonstrate the superiority of the Capitalist system. Investors developed an economy based on technological progress and the export of manufactured goods. The natural qualities of patience, dexterity and tenacity of the Chinese people helped Taiwan to achieve economic success and made it a nation whose manpower is the best qualified in the industrialized world. At this period, too, agricultural reform assured the financial viability of the Island's main farming produce. The island's population of 23 million is, for the most part, of Chinese origin. It also has minority groups of aborigines immigrated a long time ago from Indonesia and Malaysia. Though urbanized and industrialized, Taiwan has preserved natural sites of awesome beauty and temples representing the delicate architecture of ancient China. The world's largest collection of ancient Chinese artefacts, jades, porcelains, bronzes and paintings on silk can be seen in the National Palace Museum of Taipei. Many items in this collection were brought by Tchang Kai-shek at the time of his exile, and came from treasures accumulated by the Chinese emperors in the Forbidden City of Peking. In the years that followed the Communist takeover in Mainland China, the Catholic institutions were confiscated and the missionaries expelled. This is how, in 1953, the last of our Canadian Sisters in this mission left the country. One year later, at the request of the Jesuit Fathers, three of our former missionaries of China came to Taiwan and settled in Kuanshi, a small town of the prefecture of Hsinchu. At the time of their arrival, the city's population numbered 35,000, not a single one of them Catholic. Already familiar with the Mandarin language, our missionaries helped with the running of a kindergarten and engaged in home visitation. In that post-war era, the needs were great. Other Sisters joined the initial group and responded to those needs. Dispensaries and maternity clinics were opened and social projects initiated. Along with the other missionaries who had come from China, our Sisters brought a new breath of life and an era of prosperity for the expansion of Catholicism in Taiwan. Staunch conserver of Chinas art, Taiwan is also the preserver of the oldest religions traditions such as Buddhism, Taoism, Confucianism and the worship of the ancestors. These traditions have shaped the life and culture of the people for thousands of years. They provide interpretations of the Absolute, of the human person and its existence, of the evil that exists in the world and of the ways to free oneself from it. Half a century after the massive arrival in Taiwan of missionaries from China, we find a Church whose membership numbers 8% of the population. Aware of the rich Chinese cultural heritage and of the transformations currently taking place in Taiwanese society, our Sisters state as follows their mission in this Church: To proclaim Jesus Christ to those who do not know Him and to accompany the Christian people in the deepening of their faith that they may bear witness to Jesus Christ and to the Gospel in the midst of this pluralistic society.